The meteoric rise of survival video games is impossible to overlook. Everyone has caught the battle royale bug, whether it’s Fortnite, PlayerUnknown’s Battlegrounds (PUBG), Arma 3, H1Z1, or The Culling. These survival games share core elements with poker tournaments. They each have long lulls in the action punctuated by thrilling terror. Much like an MTT, there can only be one winner in a battle royale survival game. Simply put, avoid elimination to be the last person standing. It’s no wonder PUBG and Fortnite are among the most popular games in the zeitgeist. Last-person-standing battle royales are fun and challenging contests where you compete against a global pool of players. Survival games reward skill, but there’s a strong component of luck, or the RNG, which levels the playing field and fosters an “anyone can win at any time” element. Even the top players are subject to randomness, variance, and bad beats. The premise of Fortnite or PUBG is you jump out of a battle bus or cargo plane and parachute onto an island with 100 other players in a winner-take-all fight to the death. A number of aspects of battle royale games share similarities with freezeout tournaments, including a multitude of playing styles, varying philosophies, and tactical approaches to the game. There’s no “correct” way to play a survival game, but adhering to specific strategies will produce stronger results over the long term. No one ever wants to be the first player to bust in a poker tournament, particularly on the first hand. Don’t be the first idiot out in PUBG or Fortnite, especially if you’re playing squads. Survive the early onslaught by avoiding jumping into highly populated areas and cities. Unless you’re skilled at close-quarters combat with lo-fi weapons (a.k.a. the frying pan or a pick axe), seek out a less popular landing zone. Get to know peripheral areas on your map and loot/scavenge without worrying about a frenzied firefight. Surviving an all-out brawl against 99 trigger-happy opponents seems like a daunting task. If you initiate tight MTT strategy, you can increase your overall edge by fighting a reduced field. The majority of the field liquidates itself in the first five minutes of the game, so don’t be one of those early causalities. Avoid unnecessary engagements and stay cool while the other aggro-donks bust themselves. Patience will keep you alive. Noobs love to throw down from the get go, wasting precious ammo and medical supplies. Vets sidestep early skirmishes and scavenge for better equipment — stronger weapons, ammo, and defensive gear — before they rush into a high-noon showdown in the middle of Pochinki or the Tilted Towers. A tight-aggressive poker approach is the way to go in the early stages. Aggression is paramount in survival games, but you have to pick your spots. Playing too many pots is a common leak for amateurs and pros. The old adage also seems appropriate: don’t go broke in an unraised pot. In survival games, engaging in a firefight is an all-or-nothing situation. You’re essentially going all-in on every hand, so you better have the proper equipment to survive a shootout. There are no rebuys or re-entries. Once you’re out, you’re out. No need to risk it all early on. Fight only when necessary in the early stages, otherwise keep scavenging for better gear and weapons. Utilize the initial grace period wisely to loot efficiently while letting the field thin itself. Picking up a tell on your opponent is a crucial part of poker, particularly sniffing out bluffs. In live poker, visual tells affect the decision-making process such as increased breathing, hand movements, and voice inflections. If you can pick up a specific pattern recognition (e.g. betting amounts and hand ranges) faster than your opponents on the virtual felt, then you’re gaining a tremendous advantage playing online poker. In survival games, your ears are as important as your eyes. The premier gamers play with headphones so they will not miss potential audio tells. If you listen carefully, your opponents often telegraph their actions. Whether it’s the sound of an adversary running nearby, a distant shotgun blast, or someone hacking down a wall, you will gain a significant edge by listening carefully. Audio tells will help you track your opponents and/or prevent potential ambushes. On the flip side, minimize your audio footprint! If you can hear opponents, assume they can hear you. In the middle stages of a poker tournament, it is paramount to accumulate chips at a steady rate to keep up with the blinds/antes. You must mix it up in the middle stages to avoid getting stuck with a short stack. What good is making the final table if you’re short? The same goes for the mid-stages of survival games, where you have to chip up to compete with the bigger stacks. In this case, it’s ammunition and supplies. You should be pushing toward the safe zone in PUBG, or outrunning the Storm in Fortnite, while looting along the way. Always be on the prowl for superior weapons and healing materials. Horde up on supplies whether it’s ammo, medkits, or building materials. Also, it’s the time to engage in a fight instead of avoiding one. Winning isolated shootouts in the mid-stages is the quickest way to acquire top-notch gear from deceased opponents. The white circle (safe zone) and blue circle (death zone) in PUBG are the equivalent of escalating blinds and antes. In Fortnite, you have to keep moving to the center of the circle to avoid the Storm. These playing zones are determined by RNG and will reset itself every few minutes while shrinking inward. Your general movement should always be toward the circle. If you get caught outside these circles for too long, then you will die. In a poker tournament, escalating blind levels are their version of the blue circle or Storm. You must always monitor the tournament clock for upcoming level jumps and blind increases. In PUBG, you cannot lose sight of the blue circle in relation to the safe zone. Same goes for Fortnite and the Storm. Never wait until it’s too late to move to the safe zone. Once you get a knack for how the circles work, you’ll realize it’s one of the biggest gambling elements in the game. Predicting the location of the next safe zone will give you a chance to get a jump on the remaining field. If you can penetrate an unexplored area in a newly spawned safe zone, then you can beat the rush and gain a substantial advantage. While opponents are frantically avoiding the Storm or the blue circle and rushing toward the safe zone, you get to cherry pick unlooted areas. You can also set up a defensive position, find an ideal sniper location, or set a trap. You have the tactical advantage so long as you can see your opponent and they can’t see you. The poker equivalent is position, or acting last. Avoid getting out of position, which means do not aimlessly wander through open fields or rest in an uncovered spot. Keep moving and if you’re in an urban area, always beware for snipers above. Fortnite gives you the ability to build a defense in an open area. Building a shelter quickly under fire allows you to extend your game play and heal your injuries. New players commit a common strategical error by prematurely revealing their hidden location. You must eliminate your target quickly with minimal exposure, so opponents cannot zero in on your location using scopes or by sound. When in doubt, shoot and move to avoid detection. In fluid firefights, shoot and maneuver to create confusion while preventing stationary opponents from locking in on your location. Scavenging or looting late in a survival game is the equivalent to stealing the blinds in a poker tournament. It’s a key element to staying alive while the blinds are going up and you’re card dead. In PUBG, a vehicle covers ground quickly so you don’t have to worry about falling behind the looming blue circle. A vehicle allows you to loot the edges of the safe zone. Do not wait until the last minute to prep for the end game. Utilize the downtime to gather scopes, grenades, and healing items (painkillers and energy drinks). A long-range scope will be your best friend in PUBG. The 8x scope is optimal for long-range sniping, but you really need at least one 4x scope to survive the end game. In Fortnite, you have to stock up on building materials to prepare for the end game. Never pass up the chance to smash a car for steel or a boulder for stone. The brick wall you build will inevitably save your life. Setting simple traps can be an efficient way to improve your hit count. Slow-playing a big hand in poker (e.g. 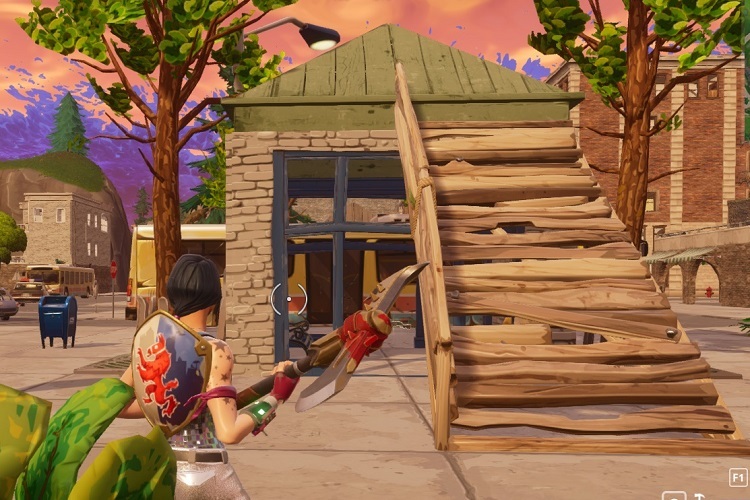 flopping the nuts or set-mining) is like running a “first aid trap” where you lure an opponent into an ambush by using a medkit or slurp juice as bait. Sometimes, if you find the perfect cover, you can pick off multiple opponents with the same trap. If you’re able to acquire a ghillie suit in PUBG (only available via air dropped supply crate), then you’ll acquire the power of invisibility in grassy areas and ambush unsuspecting opponents who walk right into your kill zone. Advanced builders in Fortnite will know how to create and set-up a wall or floor trap. Traps are vital in fending off monsters from the Storm, but they can be time consuming. Traps are risky in both poker and survival games. Slowplaying a set can often result in disaster if you let your opponent catch up on their draw. There’s a similar downside in survival games. Traps will backfire, and when they do… it’s ugly. Find the ideal spot to set a trap, but make sure you’re not walking into one. Making it to the last ten players in a battle royale is equivalent to advancing to the final table of a poker tournament. The final 15 is akin to the final table bubble. The last five is the most difficult aspect of Fortnite and PUBG. The proper gear will thrust you into an advantageous position to win. You’d be foolish to head into the end game without enough ammo, healing supplies, and building materials. The end game boils down to two options in battle royales: hunting or defense. If you have a tactical advantage over your opponent(s), then attack. If you’re surrounded or outgunned, hunker down into a defensive position and force them come to you. Remember to always give yourself an escape route and beware of incoming grenades! To sum up… poker tournaments and survival games have much more in common than you thought. While you’re learning the intricacies of PUBG and Fortnite and developing your own game plan, a simple tournament strategy will provide an added edge. If you stick to a patient and disciplined regimen and employ basic poker strategy, you will consistently go deeper into games and win a chicken dinner at a higher rate than your friends.